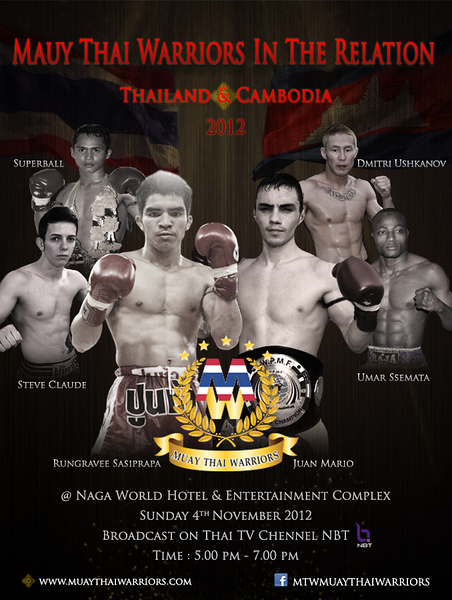 The Muay Thai Warriors card taking place in Phnom Penh on Sunday, November 4th, 2012 has been fleshed out. The event will be broadcast live on NBT Channel 11. The card is actually not Thailand Vs. Cambodia as I originally assumed, but instead will have a theme with Thai and Cambodian boxers fighting fighters from Spain, England, France, Brazil, Russia and Australia. basically as the promotional poster roughly indicated, this is an event to improve relations between Thai and Khmer boxers. The main event will be Rungravee Sasiprapa versus Spain’s Juan Mario Kaewsamrit. Rungravee Sasiprape is the Channel 7 Stadium champion as well as being Muay Thai Association of America’s (MTAA) world champion. Rungravee won the MTAA title against Japanese fighter, Kuni­taka Fuji­wara. He was last sighted in the United States fighting on the M-One: Thailand versus the Americas event where he ended a fight against Andres Martinez by knee TKO. More recently, Rungravee defeated highly rated Irish Thaiboxer Stephen Meleady by decision at the Muay Thai Gala on Thai TV 11. Juan Mario Kaesamrit of Spain has been staying at the famed Kaewsamrit gym building up a steady record of wins. And enough of these wins have stacked up to now make him a top 10 ranked boxer in Rajadamnern Stadium at super featherweight, a hotly contested weight class in Thailand’s Muay Thai scene. Sadly, yes the poster actually has “Muay Thai” misspelled by what I’d assume is part of the Thai promotional team. If nothing else it looks very interesting and entertaining though obviously it lacks some of the spark of international appeal with the absence of Saenchai. For those of you that need less sleep than me it will likely be streamed starting at 2:00 AM Pacific time and 5:00 AM Eastern Time in the United States.